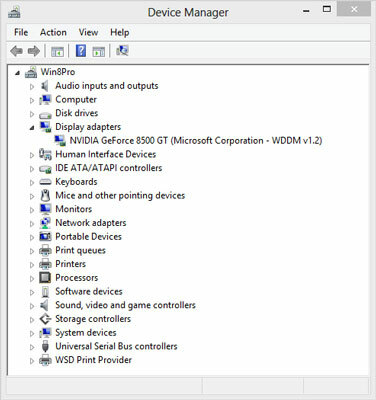 Device Manager in Windows 8.1 is your point of first resort when something goes wrong with the hardware — the devices — on your system. It’s a Control Panel applet that gives you limited access to information about every piece of hardware Windows identifies on your system. Unless your network card implodes or the cat takes a leak on one of your PC’s exhaust vents, the most common source of hardware problems lies in the device driver — the program (sometimes a huge program) that handles the interaction between Windows and your device. When you install a new piece of hardware, chances are very good that it’ll install all by itself, without any intervention from you. Simply plug most USB devices into a Windows machine, Windows installs all the drivers it needs, and you’re off and running in no time. However, once in a blue moon, Windows either can’t find or has trouble installing the device driver. When that happens, never — absolutely never — use the device driver software that came in the box with the new hardware (by the time the manufacturer ships the box and you buy it, the driver may have gone through ten revisions!). Instead, go to the manufacturer’s website and download the latest version of the driver. 1Bring up the Control Panel. Swipe your finger from the right edge of the touchscreen to choose the Settings charm (one of five charms, or fast ways to get to often-used actions), then Control Panel; or right-click in the lower-left corner and then choose Control Panel. 2Choose System and Security, then System, and on the left choose Device Manager. 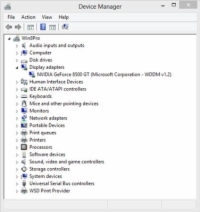 Windows opens the Device Manager applet. 3Tap or click the wedge sign next to the heading that contains the device you want to update. You may have to try several headings to find the right one. If you guess wrong, just tap or click again to collapse the heading you expanded. Don’t worry. You aren’t breaking anything. Yet. 4Tap and hold or double-click the device to open the Device Properties dialog box, and then tap or click the Driver tab to display details about the driver. You can identify the latest driver by its date, version number, or both. If your new driver is on a USB drive, put it in the PC; if it’s sitting on the hard drive, make sure you know where it is. 5Tap or click the Update Driver button. Windows asks whether it should search automatically for updated driver software or browse your computer for driver software. If you tell Windows to search automatically, it goes out to Microsoft’s big driver database in the sky and retrieves whatever Microsoft thinks is the best driver. Unfortunately, Microsoft has a bad track record for storing and proffering old, sluggish (but usually stable) drivers. That’s why you went out and retrieved the manufacturer’s recommended driver in the first place. 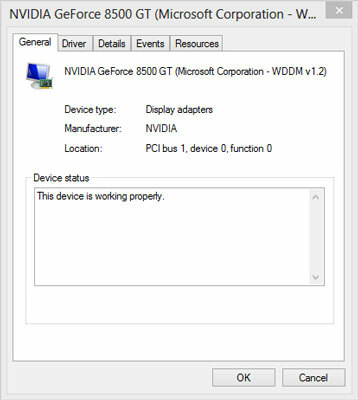 Note that Windows does not automatically check the manufacturer’s site for the latest drivers. Instead, it relies on the drivers that have been checked in to its driver database — and many of those drivers are weeks, months, or years out of date. 6Tap or click Browse My Computer for Driver Software; then point Windows to the location of your updated driver and tap or click Next. Windows may step you through installing the new driver. Or it may tell you that the driver you have is the best one for your device. In either case, take Microsoft’s suggestion and leave it at that. Always, always reboot your PC after installing a new driver, even if it isn’t required. That gives Windows a chance to trip and fall while the event’s still clearly in your mind. It also gives you a chance to reboot to the Last Known Good Configuration if you want to roll back the driver.